Sandycoombe Lodge on the corner was the home of the artist JMW Turner from 1813-26. The Palladian villa which was built in the 1720s for Henrietta Howard, the mistress of George II, is now in the care of English Heritage. The park is open to all and there is a cafe in the stable block. Exit onto the riverside path passing an old Black Walnut tree and go to the right. Continue through Orleans Gardens and under two footbridges along Riverside. On the right is Dial House, the home of the Twining (tea) family from 1722. It was donated to the parish for use as a vicarage in 1890. Number 25 (c1720) now houses the Twickenham Museum (see below) but has been the home of the Twining and Hammerton (ferry) families. The Mary Wallace Theatre is housed in what was once a mission room housing the parish soup kitchen. On the left is Eel Pie Island which can be reached via a footbridge. There is a riverside plaque with information on its musical history opposite the Barmy Arms pub (former Queen's Head). This would have been the main street at one time. St Mary's was in existance before 1332. It was rebuilt in 1713 by John James after the nave collapsed but retains its Medieval tower. It is the burial place of Alexander Pope. York House built in 1635 is now in council use. The grounds include a Japanese Garden, tennis courts and a metal urinal. Orleans House was built in 1710 by John James for James Johnston, Secretary of State for Scotland. From 1815-7 it was occupied by Louis Philippe, Duc d'Orleans (later King of France) during his exile (hence the name). 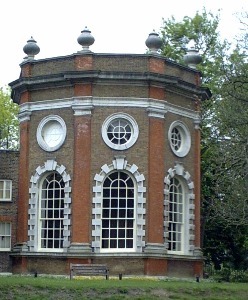 The Octagon was designed by James Gibbs in 1720 as a garden pavilion. The house was demolished in 1926 but the Octagon and adjoining wings were saved by Mrs Ionides and now house a gallery. The former stables block has more gallery space and a cafe. Exit through the wooded grounds into Orleans Road and go left. There is a former school of 1856. The fine houses date from the 1720s and there are plaques to Walter de la Mare and Tennyson. The Twickenham TIC is in the Civic Centre in York Street Tel 020 8891 7272. The Twickenham Museum is housed in 25 The Embankment. Admission is free but opening is limited to Tues & Sat 11-3 and Sun 2-4. Tel 020 8408 0070. The award-winning website has lots of information on the area. There are guided walks available on summer Sunday afternoons led by voluntary guides (charge) Tel 020 8977 2806. A history of Orleans House can be downloaded [click here] There are 4 large PDF files.